Lemur Luffy and Cat Sanji Cosplays done for fun and for a club party. Hey peoples!! I give you the second batch of cosplay crack pics!! Includes vid of us all laughing and gives you sense of the crazyness. Crack pairings/three somes ect. (Based on what costumes we had so its a weird combination. Luffy x Spadam lols). What happens when luffy gets blindfolded when evil fangirls are present ect. Warning Not work safe lol. I hope you guys enjoy these pics as much as we enjoyed taking them!! And if you did please comment so I will know, and if you have any ideas for future crack photoshoots or such. Photos taken by the great senko_kage. 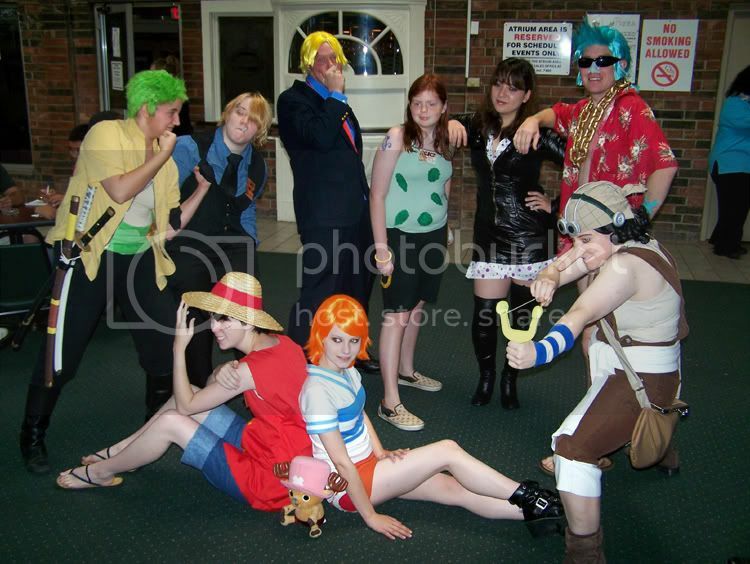 So, my friends and I cosplayed as the Mugiwara at IzumiCon 2007 over the weekend. Here follows some crossposted crack. Three videos, and several photos. Probably more to be added as I get them. Hope you don't mind! "Cute in that I Have No Facial Features But Still Cute Way." Robin Waxes Franky's Chest. Lulz Ensue. I'm a cosplayer more than anything when it come sto fanstuff for any fandom. I'm not much of an artist (though I love to draw!) and I am a good writer, but I'm not very prolific. So...yesterday, my fiancee, two of our best friends, and I went to do a Mugiwara photoshoot. And despite the sun being very annoying in a lot of photos, we got a lot of good and funny ones! (I still can't believe how TAN I look compared to Luffy!) I also love how well Usopp's nose was blended in; it's never looked so good! Hope you get a kick out of them like we did! Note: HUGE photo dump! Not 56k friendly! STILL GOT SOME FINISHING TOUCHES TO GO..BUT TAIL AND STUFF DONE..
ORANGE SHIRT (WATER SEVEN) PLUS CAT!! ZOROS SWORDS...(THEY ARE WOODEN!!) BUT SHEETHS ARE CARBOARD. But here's the two I DID get! In two weekends, we be taking One Piece to AFest Dallas. Shanks, Buggy, Iceburg, and Zoro, Sanji, Usopp. Robin and possibly Nami too! - Name: Charli, but you can call me Youshi!